Whenever I tell anyone about my Easter plans the first thing they say is "are you doing it for charity". When we conceived this endeavour raising money for charity was the last thing on anyone's mind but the more people asked, the more it seemed like a good opportunity. We have therefore chosen to support the Shadwell Basin Project by raising funds through sponsorship. 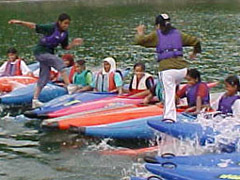 'The Basin' is the outdoor activity centre in Tower Hamlets, East London where our club is based. We have the use of their facilities on a Tuesday night but for the rest of the week the centre is used to run programmes for local school children that include kayaking, sailing and climbing. If you have been following our progress here and would like to help support this very worthwhile cause (and give our morale a boost at the same time) then please consider sponsoring us through our online sponsorship page.